It is all about water – that flamed the States to become warring factions and placed at Parliament and doorsteps of Apex Court. In a land fuelled by perceived notions, a movie Dam 999 further fuelled the hysteria. Besides Cauvery water dispute, another river issue, that originates from the Sivagiri peaks (1800m MSL) of Sundaramala in Tamil Nadu; runs a total length of about 244 Kms, flows northwards for 48 kms and at Thekkady joins the west-flowing Mullayar – it is the river Periyar on which the dam constructed became a bone of contention – the Mullaperiyar dam. Speaking to the Central Board of Irrigation and Power in November 1958, Jawaharlal Nehru emphasised the need for irrigation projects and electric power and uttered ‘dams are the modern temples’ !! ~ here is a photo of an otherwise ordinary woman in a Public function getting limelight and photo appearing in Newspaper – sadly, she would only rue that coverage !! Damodar River flows across the Indian states of West Bengal and Jharkhand. Rich in mineral resources, the valley is home to large-scale mining and industrial activity. It had a forgettable past of being called ‘ the Sorrow of Bengal’ due to ravages by floods. The dams built across changed this notion. The valley rich in coal is considered as the prime centre of coking coal in the country. Three integrated steel plants (Bokaro, Burnpur and Durgapur) of Steel Authority of India Limited (SAIL) and other factories are in the valley. There also exists Panchet dam, constructed across Damodar river. As a result of the catastrophic flood of 1943, the Governor of Bengal appointed the Damodar Flood enquiry committee to suggest remedial measures. It suggested creating an authority similar to that of the Tennessee Valley Authority in the United States. While earlier construction of eight dams and a barrage was envisaged, it boiled down to four dams - Tilaiya, Konar, Maithon and Panchet, and Durgapur Barrage. The last of them at Panchet was inaugurated in 1959. What could be the punishment for a woman who holds a man's hand in India? In urban centres of the country in 2016, this may seem like a useless question. But in some rural pockets, that continue to remain conservative, she could be thrown out of her village or killed even today. Imagine what could have been the situation in 57 years ago. A tribal woman of West Bengal has been the victim of such conservativeness and fighting for prestige since 1959. It is ironic that the name of India's first Prime Minister Jawahar Lal Nehru, who stood for progressiveness, is associated with her plight. It so happened that Nehru had visited a West Bengal village to inaugurate a dam in 1959. On his request, the dam was inaugurated by Budhni Manjhiyan, then a 17-year-old girl. 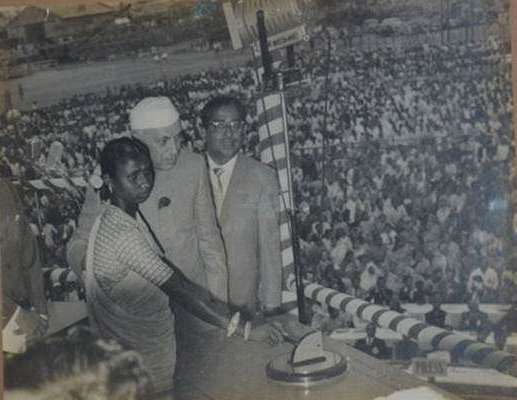 She was probably the first labourer in the country who got the opportunity to inaugurate a dam. During the programme, Nehru handed over a garland to Budhni. This one incident changed Budhni's life forever. Danik Bhaskar reports that at night a panchayat of the Santhali society was called to discuss the incident. To her utter shock, Budhni was told that according to tribal tradition she was now the wife of Nehru as he had given her a garland. However, as Nehru was not a tribal, Budhni was thrown out of the village and boycotted from Santhali society on the charge of marrying a non-tribal man. At that time, Budhni was a worker in Damodar Valley Corporation (DVC). She worked there for some time, but she was removed from there also in 1962. Later, Budhni went to Jharkhand and struggled there for seven years. Bhaskar reports that later she met a man named Sudhir Dutta, who befriended her. However, both couldn't marry because of fear of the society. But they remained together and now she has three children. In 1985, Nehru's grandson and then PM of India, Rajiv Gandhi learnt about Budhni's story. She even went to meet Rajiv in Odisha. Later, the DVC took her back on job. Now retired, Budhni told Bhaskar that she had visited her village after several years. She goes there even now on occasions but still she can't see a respect in the eyes of people for her. Budhni now wants Rahul Gandhi to get her a house and give a job to her son so that she can spend remaining years of her life in peace. Damodar river has really been a sorrow in this woman’s life ! !